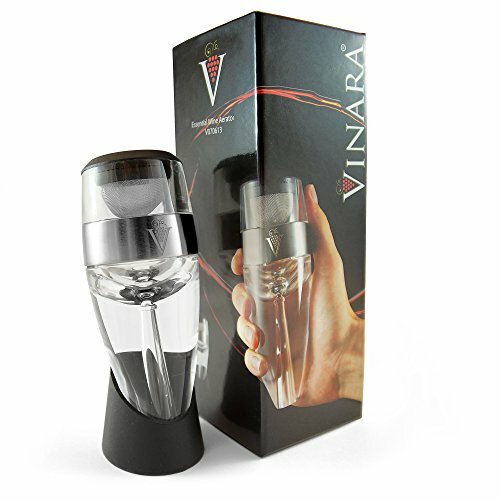 Use the Vinara wine aerator and watch the aeration as your glass fills. No decanting. Vinara brings out your wine's true essence and bouquet. No waiting. Vinara aerates wine perfectly in seconds, glass after glass. People who enjoy wine know it needs time to "breathe" to maximize the bouquet, flavor, and finish. Some open the bottle 15 minutes or so before drinking the wine, some swirl the wine in the glass, others use a decanter and funnel to pour the wine slowly. These methods do not achieve the best results. Vinara aerates the wine gently and instantly mixing in just the right amount of air in the right amount of time as you fill your glass. Vinara 360° aeration adds "micro-bubbles" of air to the wine. Oxygen in the air reacts with the organic compounds in the wine to release its aromas and flavors to enhance your taste experience. If you have any questions about this product by Vinara, contact us by completing and submitting the form below. If you are looking for a specif part number, please include it with your message.